Community engagement and behaviour change projects can take up a lot of staff time (most likely more than planned). 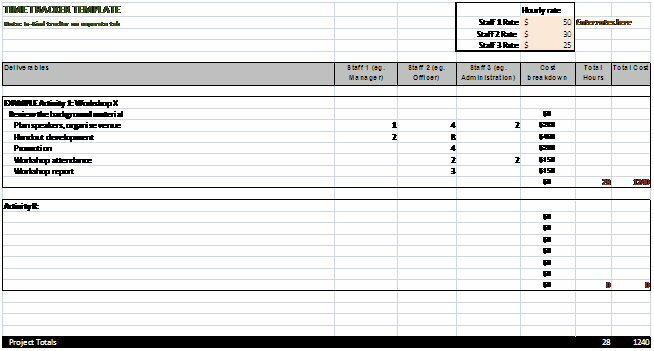 It is important to track the amount of staff time, and what activities the work is related to, so as to provide lessons for future projects. Time tracking can be done using Excel or other similar software. It is recommended that you keep notes as to why some tasks or activities take up more time than expected. This may be used to inform the evaluation of project efficiency (eg.where staff training and development may be required, or extra resourcing for future projects). Alternatively, racking time can complement reflections from a project diary. It is important to keep track of volunteers’ time spent on projects, as this can contribute to significant in-kind resources that need to be accounted for in project evaluation, especially if the project lessons feed into further iterations. A simple Excel template to track your time is provided here.